Posted 12 July 2016 & filed under Early 20th century, People, Railways, Work. This post is based on an article from the Herts Advertiser and kindly transcribed by Derek Roft. When the now disused St Albans to Hatfield branch line opened on October 1865 the Herts Mercury reported. “The first train started at half past eight on Monday morning. The engine was gaily decked with bunting, flowers and other decorations to celebrate the inauguration”. 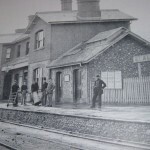 Fifteen years earlier St Albans did not even have a railway station. To get to London by rail, passengers had to ride in coaches to Hatfield to use the Great Northern Railway Line. Then in 1858 the St Albans to Watford, London and North Western Railway branch was opened. Of the station buildings on the St Albans to Hatfield line, the first stop at London Road is the best preserved. London Road station was also the scene of a murder. The station master at the time was Jonas Ellingham. He was a zealous official who ran his station with the efficiency of a sergeant major. But one morning in August 1918 things were not quite right. He did not appear on the platform to flag the 2.45pm train on its way. Anxious station staff dared not break into the house in case it was an innocent mistake. It was not until the evening when the dreadful truth was known. Jonas Ellingham’s body was discovered in the sitting room. He had been battered to death with a railway hammer by his wife Eliza who had tried to kill herself soon after. At her trial three months later, Eliza was found to be totally insane and unfit to plead. She spent the rest of her life at Leavesden Mental Asylum. In 1925 Smallford Station, further along the line, was the scene of another tragedy. An elderly clergyman was rushing to the station to catch the train only to collapse in the booking hall. Within minutes the clergyman was dead. More information about Jonas Ellingham and other stationmasters who were employed at London Road station can be found here.